Since the 80s, enterprises transact using technologies providing one-to-one consensus such as EDI, MFT, email, fax. APIs have recently emerged to provide new B2B experiences for cloud, mobile and social. EDI is a powerful and stable system with a developed support network – in fact, EDI systems and transaction volumes continue to grow. According to a recent study by Forrester, the annual volume of global EDI transactions exceeds 20 billion per year and is still growing. One major reason enterprises will continue using EDI – and will invest in its further development – is that too much has been spent building properly working EDI systems worldwide. It took literally years, and in many cases tens of millions of dollars, for any large enterprise to implement what has become a reliable and cost-efficient transactional system. However, EDI and one-to-one technologies continue to pose several challenges and limitations that enterprises must contend with. A growing number of CIOs and enterprise architects are looking at blockchain technologies to prepare their infrastructure for a modern B2B world created by N-to-N consensus. It’s important to note that not all blockchain platforms are alike, however. Enterprises have already changed focus from public blockchains, like Bitcoin or Ethereum, to private blockchains (aka distributed ledger technologies). A private blockchain can provide distributed workflow automation and visibility, improved data quality and auditability, real-time transaction settlement and compliance, digital asset management, as well as securing sensitive, high-volume transactions. But key distinctions exist also among private blockchain platforms in terms of scalability, resilience, community management, or smart contract capabilities as each target specific use cases. 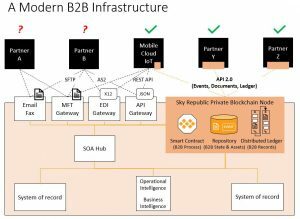 A private blockchain is engineered to be used at the edge of the enterprise, where it can process and record B2B transactions and their related events or documents. An enforceable ledger is shared in real time among parties to establish N-to-N consensus. The market is now seeing significant investment in private blockchain networks, and these projects seem poised for real short-term impact. Some organizations are tackling specific problems in transactions across boundaries with localized applications. Companies in manufacturing and transportation/logistics are already using private blockchain to track items through complex supply chains, for instance. Increasing interest in private blockchains spans the financial services, insurance, healthcare, life sciences and pharmaceutical sectors as well. A private blockchain can establish a shared, secured record of information flows, as well as a ‘shared version of events’ across B2B networks. This ‘shared version of events’ not only provides improved traceability and product integrity, but also greater process efficiencies, better multi-party collaboration, and streamlined resolution processes when exceptions or disputes occur that require manual intervention. Real-time alerts can also be sent automatically to all parties involved with the transaction to keep everyone in the loop when requirements are met, or things change, thereby facilitating compliance and expediting transaction settlement. With a private blockchain, better interoperability and governance among parties is achieved by using smart contracts to implement business rules that can monitor transactions. This could include checking for important data such as price differences, valid POs and product availability dates. This data validation and error detection would occur before the transaction can be processed, allowing parties to make corrections to avoid unnecessary and costly delays further downstream. Additionally, a fundamental problem with EDI security is that once you send EDI documents to a trading partner, you cannot control what your trading partner will do with that data. Nor do you control any of the other points along the chain of transmission – you only control what is going on in your own organization. With the use of a ledger that is distributed on multiple servers and shared by all parties to the transaction, the risk of losing any transaction data is virtually eliminated. Furthermore, the inherent nature of blockchain – with its immutability, encrypted data and requirement that any contractual changes must be agreed to by all parties – means it would make it next to impossible for anyone to fraudulently manipulate the data. Though technically speaking a private blockchain could potentially replace EDI, this would probably not provide any return on investment. Instead, a private blockchain should be viewed as a significant value-add that can provide a shared state of the business. By using a shared distributed ledger designed for many-to-many interactions, it should be considered as a well-suited option to fix deficient B2B processes, as well as a platform for delivering new innovative B2B services.